Enjoy a Caribbean vacation, with the benefit of a baby grand piano in the living area, and a golf course just out the back door. Board games and a library provide entertainment for everyone, and the outdoor pool is great way to cool off from the Caribbean sun. Evenings can be filled with a tasty BBQ dinner, and you can take turns deciding who cooks the meal. When everything’s been said and done, you can sit back and watch the sun go down over St. Croix’s east end. There is weekly maid service to keep everything organized, so you don’t even have to worry about chores. 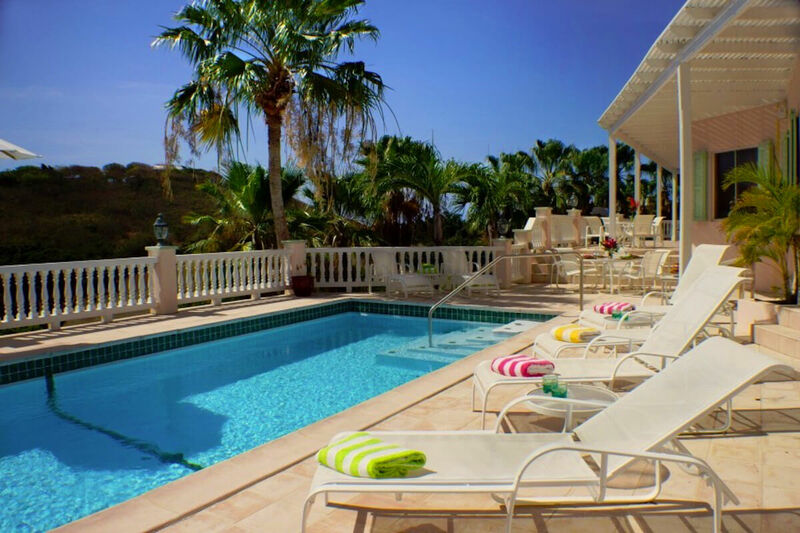 Catch A Wave is a fully air-conditioned villa on the northeastern coast of St. Croix. This villa is conveniently located on the sixth hole of the Buccaneer golf course and surrounded by mature palms and bougainvillea for privacy. Tropical landscaping and flowering vines frame the terrace’s sunset view over the hillside. The lap pool borders the deck and loungers line the opposite side. There’s other lounging and dining decks to the side and under the veranda. Guests can BBQ on the Weber grill and gaze out at the island’s natural beauty. There’s also pool floats, beach towels, and coolers if guests want to drive down to Punnett Point, Shoy Point, Martel Bay, or Beauregard Bay. Inside, an extensive art collection and baby grand piano set the villa apart. The art collection is composed of original works by local artists, and traditionally Caribbean touches run throughout. Catch A Wave has a library, chess and backgammon boards, and two reading nooks in its fully air-conditioned Great Room. The kitchen is well-equipped with standard appliances, a breakfast bar, a dining table, and access to the terrace. All four bedrooms have an ensuite bathroom and sleeps two. The large master suite has access to the deck, a mahogany four-poster king bed, a reading area, and a study. The master bath is complete with a glass-walled shower and claw-footed tub. The second bedroom also has a king mahogany bed, a glass-walled shower, and French doors leading to the deck. The third bedroom has a queen bed, a small library, a reading area, and a glass-walled shower. The fourth bedroom is in its own garden apartment and has a queen bed and ensuite bathroom. WiFi runs throughout the home, so guests can work or study in their rooms. Catch A Wave is minutes from the Buccaneer’s Mermaid Restaurant and a short drive away from diverse cuisine in Christiansted. The Buccanneer has a spa, golf, tennis, beaches, and recreation for a relaxing, fun-packed experience.